This entry was posted in Uncategorized on 22/01/2018 by klarmprototyping. This entry was posted in Uncategorized on 20/01/2018 by klarmprototyping. The Traction Avant, French for "front wheel drive", was designed by André Lefèbvre and Flaminio Bertoni in late 1933 / early 1934. While not the first production front wheel drive car – Alvis built the 1928 FWD in the UK, Cord produced the L29 from 1929 to 1932 in the United States and DKW the F1 in 1931 in Germany – it was the world’s first front-wheel drive steel monocoque production car. Along with DKW’s 1930s models, the Traction successfully pioneered front-wheel drive on the European mass car market. The Traction Avant’s structure was a welded monocoque (unitized body). Most other cars of the era were based on a separate frame (chassis) onto which the non-structural body ("coachwork") was built. Monocoque construction (also called Unit Body or "Unibody" in the US today) results in a lighter vehicle, and is now used for virtually all car construction, although body-on-frame construction remains suitable for larger vehicles such as trucks. The novel design made the car very low-slung relative to its contemporaries – the Traction Avant always possessed a unique look, which went from appearing rakish in 1934 to familiar and somewhat old fashioned by 1955. The suspension was very advanced for the car’s era. The front wheels were independently sprung, using a torsion bar and wishbone suspension arrangement, where most contemporaries used live axle and cart-type leaf spring designs. The rear suspension was a simple steel beam axle and a Panhard rod, trailing arms and torsion bars attached to a 3-inch (76 mm) steel tube, which in turn was bolted to the monocoque. Since it was considerably lighter than conventional designs of the era, it was capable of 100 km/h (62 mph), and consumed fuel only at the rate of 10 litres per 100 kilometres (28 mpg-imp; 24 mpg-US). Traction Avant rears. The boot was lengthened and its volume doubled in Autumn 1952. The original model, which was presented on 18 April 1934, was a small saloon with a 1,303 cc (79.5 cu in) engine. This model was called the 7A, which was succeeded in June 1934 by the 7B with a higher-power engine of 1,529 cc (93.3 cu in). The 7B in turn, was succeeded in October 1934 by the 7C with an even higher-output 1,628 cc (99.3 cu in) engine. Later models were the 11 (launched in November 1934), which had a 1,911 cc (116.6 cu in) four-cylinder engine, and the 15 (launched in 1938), with a 2,867 cc (175.0 cu in) six. The numbers refer to the French fiscal horsepower rating, or CV. The 11 was an 11 CV, but curiously the 15 was actually 16 CV. The 11 was built in two versions, the 11L ("légère", or "light"), which was the same size as the 7 CV, and the normal model 11, which had a longer wheelbase and wider track. Citroën planned two variants that never entered production, since there was not enough funding available to develop them, except as running prototype vehicles. One was an automatic transmission-equipped model, based on the Sensaud de Lavaud automatic transmission, the other a 22 CV model with a 3.8 liter V8. The transmission (which was actually originally designed for the Citroen) was a "gearless" automatic, using the torque-converter alone to match engine revolutions to the drivetrain revolutions, much like the Dynaflow Transmission introduced later in the USA. The car was supposed to have a less spartan interior than the other Traction Avants and it was to feature Citroën’s own new V8 engine. About twenty prototypes were made, but when the project was canceled in 1935 due to Michelin’s takeover; they were probably all destroyed. In addition to the 4-door body, the car was also produced as a 2-door coupé with a rumble seat, as a convertible and as an extended length Familial model with three rows of seats. There was even a hatchback-type Commerciale variant, in 1939, well ahead of its time, in which the tailgate was in two halves, the lower of which carried the spare wheel with the upper opening up to roof level. A one-piece top-hinged tailgate was introduced when the Commerciale resumed production in 1954 after being suspended during World War II. In September 1939 France declared war on Germany and in June 1940 the German army rapidly invaded and occupied Northern France. The war years were characterised by a desperate shortage of raw materials for civilian industry and of petrol, but these factors were not apparent instantly. The Paris Motor Show scheduled for October 1939 was cancelled at short notice, but Citroën’s own planned announcements had involved the forthcoming 2CV model rather than any significant changes to the Traction. For the Traction, the last “normal” year in terms of production levels was 1939, and 8,120 of the 2910mm wheelbase 1628cc engined 7C models were produced. This tumbled to 1,133 in 1940, which was the first year when the plant suffered serious air-raid damage – on this occasion caused by a German attack – on 3 June 1940. Production of the cars was suspended in June 1941, by when a further 154 had been produced in the six-month period just ended. The 7C would continue to appear in Citroën price-lists until March 1944, but production of this smaller engined “7CV” version of the Traction was not resumed after the war. For the more powerful 1911cc engined 11 B-light models, the equivalent figures were 27,473 units produced in 1939, 4,415 in 1940 and 2,032 for 1941, though for this model production in 1941 ended only in November 1941 so the figure for that year represents 11 months of production. In 1945 production restarted only slowly: the 11 B-light reappeared very little changed from the 1941 cars except that headlight surrounds were now painted rather than finished in chrome. By the end of December 1945 the year’s production had reached 1,525. Currency depreciation is evident from the car’s listed price which had been 26,800 francs in January 1940, and had risen to 110,670 francs in October 1945. In 1945 the car was the only model available from Citroën, and as another sign of the times, customers not able to supply their own tires were charged an additional 9,455 francs for a set of five. In May 1946, presumably reflecting an easing of the war-time tire shortage, the car could at last be purchased with tires at no extra cost, but by now the overall price of an 11 B-light had risen to 121,180 francs. The 11 B-normal model, differentiated from the 11 B-light by its 3090mm wheelbase, experienced a similar drop off in volumes between 1939 and 1941, with just 341 cars produced during the first seven months of 1941. After the war, a single 11 B-normal was produced in 1946, in time to be presented at the October 1946 Paris Motor Show: production built up during 1947, but during the car’s ten-year post-war period the shorter 11 B-light would, in France, continue to outsell the 11 B-normal. Initially the French army lacked enthusiasm for the Citroën Traction, believing that it offered insufficient ground-clearance for their needs. Nevertheless, by September 1939 roughly 250 had found their way into military service. With losses of cars at the frontier mounting, Citroën supplied a further 570 to the army between February and May 1940, and subsequent deliveries probably took place before military defeat intervened. During the war many of the cars were reregistered with "WH…" (Wehrmacht Heer/Army command) license plates, having been requisitioned by the German Army. These gave reliable service both in France and further afield, notably in Libya and Stalingrad. Tractions were also favoured by the Resistance, and as occupation gave way to Liberation they turned up all over France with FFI inscribed proudly on their doors. Less gloriously, the cars were known as favourites among gangsters such as the then infamous Pierrot le Fou, and his Traction gang. Left-hand drive versions were built in Paris, in Forest, Belgium, in Copenhagen, Denmark for the Scandinavian market, and right-hand drive cars in Slough, England. The Slough version of the 11L was called the Light Fifteen and the long wheelbase 11 was called the Big Fifteen. This confusing terminology referred to the British fiscal tax rating of the time, which was higher than the French, so the 11CV engine was 15HP in England. The 15CV model was called "Big Six" in reference to its 6-cylinder engine. They were equipped with the leather seats and wooden dashboards popular in the UK, had a 12-volt electrical system and were distinguished by a different radiator grille and different bumpers. Some models also had a sliding sunroof. A 1,911 cc (116.6 cu in) Light Fifteen tested by the British magazine The Motor in 1951 had a top speed of 72.6 mph (116.8 km/h) and could accelerate from 0–60 mph (97 km/h) in 29.7 seconds. A fuel consumption of 25.2 miles per imperial gallon (11.2 L/100 km; 21.0 mpg-US) was recorded. The test car cost GB£812 including taxes. A 2,866 cc (174.9 cu in) six-cylinder model was tested by the same magazine in 1954 and for this car the top speed found was 81.1 mph (130.5 km/h), acceleration from 0–60 mph (97 km/h) 21.2 seconds and fuel consumption 18.6 miles per imperial gallon (15.2 L/100 km; 15.5 mpg-US). The test car cost GB£1,349 including taxes. The Traction Avant used a longitudinal, front-wheel drive layout, with the engine set well within the wheelbase, resulting in a very favourable weight distribution, aiding the car’s advanced handling characteristics. The gearbox was placed at the front of the vehicle with the engine behind it and the differential between them, a layout shared with the later Renault 4 and 16 and first generation Renault 5 but the opposite way round to many longitudinal front-wheel drive cars, such as the Saab 96 and Renault 12 and 18 and most Audi models. The gear change was set in the dashboard, with the lever protruding through a vertical, H-shaped gate. Because this vertical orientation could have resulted in the car dropping out of gear when the lever was in the upper positions (i.e., second or reverse gears), the gear shift mechanism was locked when the mechanical clutch was engaged and released when the clutch pedal was depressed. The result of this layout, along with pendant pedals, umbrella-type handbrake control and front bench seats, was a very spacious interior, with a flat and unobstructed floor. The low-slung arrangement also eliminated the need for running boards to step into or out of the vehicle. These features made them ideal for use as limousines and taxi cabs, and they were quite popular among drivers and passengers alike. Until 1953, black was the only color available. Another technical significance of Tranction Avant was the cast aluminium alloy transaxle, which was pioneered by Hans Ledwinka in the early 1930s for Tatra V570 used in front of the engine located in the rear, but was quite radical at the time. Unlike the Volkswagen alloy case used by Hewland, the Traction Avant case could not be used up side down, as the input shaft height was much higher in relation to the output shaft axis so that the oil level needed to lubricate the gears would exceed the then-unreliable input shaft oil seal height if used upside down. So the engine needed to sit high above the ground with the oil sump space below, which was not needed by dry-sump racing engines. But the French transaxle was used by several racing car constructors in the late 1950s to 60’s with various levels of success. In the case of Jack Brabham, who personally visited the ERSA foundry in Paris to discuss a possibility to strengthen the case , the transaxle became known as "ERSA Knight" with an additional spur-gear set mounted in the bellhousing spacer (engine to transaxle adapter) suggested by Ron Tauranac, named for Jack Knight who designed the modification and made the straight-cut gears. The height offset created by the spur gear set enabled the engine to sit lower, and became the reason why Cooper T53 was called the ‘Lowline’, which not only made Brabham the World Champion in 1960 but also became the precursor to the establishment of Brabham as a Formula One constructor. 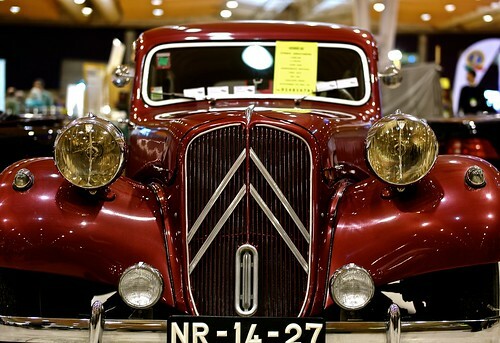 The development costs of the Traction Avant, combined with the redevelopment of its factory, were very high and Citroën declared bankruptcy in late 1934. The largest creditor was Michelin, who then owned Citroën from 1934 until 1976. Under Michelin, Citroën was run as a research laboratory, a test bed for their radial tires and new automotive technologies. In 1954 Citroën’s experiments with hydropneumatic technology produced its first result, the "15H" – a variant of the 6-cylinder model 15 with a self-leveling, height-adjustable rear suspension, a field trial for the revolutionary DS released the following year. Directly after the introduction of the Citroën ID, a simplified and more competitively priced version of the still revolutionary DS, production of the Traction Avant ended in July 1957. Over 23 years, 759,111 had been built, including 26,400 assembled in Slough in England, 31,750 assembled in Forest near Brussels and 1,823 assembled at Cologne in Germany. The total reflects the production stoppage during World War II. In 2006, the oldest surviving 7A has production number ("coque nr") AZ 00-18, and is displayed in partly dismantled shape (engine and front wheels detached) in the Citroën Museum in Paris. The oldest running 7A is probably number AZ-00-23, which was, until 1 September 2006, in possession of a Dutch owner and is now with a Slovenian owner. This entry was posted in Uncategorized on 15/01/2018 by klarmprototyping. The swinging sixties were in full flow, but in some corners of the world the peace and love mantra of the flower-power generation could not be heard. Even as hippies in London and San Francisco were weaving daisies into their hair, in China Mao Tse-Tung launched the Cultural Revolution, a 10-year political campaign aimed at rekindling revolutionary Communist fervour. Brandishing their copies of Mao’s Little Red Book of quotations, students of the Communist Party – the so-called Red Guards – pursued an ideological cleansing campaign in which they renounced and attacked anyone suspected of being an intellectual, or a member of the bourgeoisie. Thousands of Chinese citizens were executed, and millions more were yoked into manual labour in the decade that followed. Meanwhile, the US government, under president Lyndon B Johnson, was escalating its military presence in Vietnam. By the year’s end, American troop levels had reached 389,000, with more than 5,000 combat deaths and over 30,000 wounded. The war was a brutal and dirty one, with many US casualties caused by sniper fire, booby traps and mines. The Americans responded by sending B-52 bombers over North Vietnam, and by launching the infamous Search and Destroy policy on the ground. "To know war," Johnson said in his State of the Union address before Congress, in January 1966, "is to know that there is still madness in this world". There was bloodshed on the streets of London too, when Ronnie Kray, brother of Reggie, shot George Cornell dead in the Blind Beggar pub in Whitechapel in March. Two years after his proclamations about the "white heat of technology" Harold Wilson was prime minister of a Labour government that included technology minister Tony Benn. If Benn was pleased to witness the introduction of the first homegrown UK credit card – The Barclaycard – in 1966, he was in the minority. The card was met with "a tidal wave of indifference", according to a Barclays executive. Perhaps the UK public simply had other things on their minds. This was, after all, the year in which Bobby Moore’s England beat the Germans 4-2 to lift the World Cup at Wembley. Musically, 1966 was a vintage year. Jim Reeves’ Distant Drums knocked the Small Faces’ All or Nothing off the top spot. Other number ones in the year included Frank Sinatra’s Strangers in the Night, Good Vibrations by the Beach Boys, the Walker Brothers’ The Sun Ain’t Gonna Shine Anymore and The Green, Green Grass of Home by Tom Jones. The Beatles and the Rolling Stones also continued their dominance of the music scene, with Yellow Submarine, Eleanor Rigby, Paperback Writer and Paint it Black all topping the charts. A Man for all Seasons won Best Picture at the 1966 Oscars, and its star Paul Scofield won Best Actor. Other films released this year included Georgy Girl, Who’s Afraid of Virginia Woolf, Alfie and the Good, the Bad and the Ugly. On the small screen, viewers were subjected to the rants of Alf Garnet in Till Death us do Part; while US audiences were introduced to the delights of the Monkees and Star Trek. And the dynamic duo, Batman and Robin, thwarted lute-playing electronics genius the Minstrel as he tried to sabotage the computer systems at the Gotham City Stock Exchange. "Batman heads off new corporate IT disaster" – now there’s a headline to conjure with. The Queen opens the £10 million Severn Bridge on September 8. The Severn Bridge was opened in 1966 to replace the ferry service crossing from Aust to Beachley. The new bridge provided a direct link for the M4 motorway into Wales. The Severn Bridge has now carried more than 300,000,000 vehicles since it was opened in 1966. Between 1980 and 1990 traffic flows increased by 63% and there were severe congestion problems in the summer and at peak times each day. Further increases in traffic flows were expected in the years ahead. The problems encountered on the Severn Bridge were made worse by the occasional high winds, accidents and breakdowns. It is for these reasons that the Second Severn Crossing was constructed as without it congestion would become more serious and frequent on the M4, M5 and the local road network. 1966 – Thursday May 19 is a glittering night in Bristol when 800 of the West Country’s VIPs are invited to the opening of the city centre’s brand new £32 million leisure complex on Frogmore Street With a dozen licensed bars, a casino, a cinema, a night club, an ice rink and a thousand plastic palm trees, this is the biggest entertainment palace anywhere in Europe and somewhere to rival the West End of London. There are girls! In bikinis! There’s even pineapple! On sticks! Drivers park their Hillman Imps in the multi-story car park! And, amazingly enough, the venue has been an entertainment centre ever since. Bristol . . . entertainments capital of the South West, and one of the entertainments attractions of Europe. That was the talk of the town when Mecca moved into Bristol, splashed out a fortune and began building the New Entertainments Centre in Frogmore Street, towering over the ancient Hatchet Inn and the Georgian and Regency streets nearby. The New Entertainments Centre wasn’t just big, it was enormous and it was what 60s leisure and fun-time were all about, Mecca promised. Here, slap bang in the middle of Bristol, the company was creating the largest entertainment centre in the whole of Europe. A dozen licensed bars, an ice rink, bowling lanes, a casino, a night club, a grand cinema, asumptuous ballroom and, naturally, a multi-storey car park to accommodate all those Zephyr Zodiacs, Anglias, Westminsters, Minis, Victors and Imps etc which would come pouring into town bringing the 5,000 or so customers who would flock to the centre every day. London might have its famous West End. Bristol had its Frogmore Street palace of fun and the opening night of the biggest attraction of all, the Locarno Ballroom, on May 19th was the Night To Crown All First Nights, the Post proudly announced. Sparkling lights, plastic palm trees in shadily-lit bars, a revolving stage, dolly birds in fishnet tights and grass skirts . . . this was glamour a la mid-60s and Bristol loved it. 1966 – KEYNSHAM became a familiar household name to millions of Radio Luxembourg listeners across Europe in the 1950s and 1960s — thanks to a local betting expert. Self-styled ‘football pools king’ Horace Batchelor helped punters win a total of more than £12 million between 1948 and 1971 at a time when £75,000 was a fortune and his series of radio ads always mentioned mentioned Keynsham, which Horace would then spell out. Customers followed his unique ‘infra draw’ tip system, which forecast which matches would be drawn in the pools. He put the otherwise little-known town on the map by spelling out its name letter by letter so listeners would address their applications correctly when ordering tips by post. Members of the system clubbed together to enter very large permutations with a good chance of winning the pools and then sharing the takings — though each individual only received a small fraction of each big windfall. Horace himself set a world record by personally netting more than 30 first dividends and thousands of second and third dividends. During his heyday up to 5.000 orders a day were delivered via Keynsham to his office in Old Market, Bristol. His first major pools win came in 1948 when he was presented with £11,321 at Bedminster’s Rex Cinema —part of the biggest dividend then paid by Sherman’s Pools. It also included £45,000 which he shared with syndicate members. – By 1955 he had won enough to live in luxury, running three cars and puffing cigars in an 18-room house. He later retired to a 27-bedroom ‘Batchelor pad’ in Bath Road, Saltford, a small village just outside of Keynsham, which he named ‘Infra -Grange’ after his system. Pickles, the mongrel dog who found the World Cup in a London street after it had been stolen three months before the 1966 finals, became a bigger story than that year’s general election. In March 1966, a few months before the start of the World Cup finals in England, a mongrel dog named Pickles found the missing Jules Rimet trophy in a London street. One week before Pickles came to the rescue, the priceless trophy had been stolen from the Westminster’s Methodist Central Hall where it was being displayed, albeit in a glass cabinet. And this despite the presence of no less than five security guards. On that fateful Sunday, however, the guard stationed next to the trophy had taken the day off. The thieves stole in through a back door and snatched away the World Cup. For his winning role in the tale, Pickles was made Dog of the Year in 1966 and awarded a year’s free supply of dog food. His owner, a Thames lighterman named David Corbett, was a prime suspect in the case and police questioned him for hours before he was cleared. With a dramatic goal in the final moments of what was a nail-biting match, England finally became soccer World Cup champions, securing a 4-2 win over West Germany at London’s Wembley Stadium. It was just one of the many highlights of 1966 that are etched on my memory from a year that had its fair share of controversy and tragedy as well as producing some outstanding music. Controversy come in the wake of John Lennon’s quip in a newspaper interview that The Beatles were ‘more popular than Jesus now’. It caused a furor and led to thousands of the group’s records being burned on bonfires in protest in some parts of America. I recall seeing the news coverage on TV showing angry groups of people tossing piles of vinyl in to the flames. It was far cry from the outpourings of adoration and admiration that the Liverpool lads usually enjoyed. And for a while threatened to damage their reputation. The anti-Beatles outcry did however subside following an apology from Lennon and things eventually got back to normal on the Fab Four front. The catchy Paperback Writer topped the charts and their imaginative album Revolver reinstated their popularity. One of the most tragic events that year In Britain was the Aberfan coal tip disaster in Wales that claimed 144 lives, including 116 children. I was at work on a weekly newspaper on the October morning it happened. My colleagues and I had a radio on and listened to updates on and off throughout the day as rescuers dug through the tons of slurry that had roared down the hillside, desperately trying to find survivors in the mangled remains of the school building. I’ll always remember that it was a very dark period, particularly as so many young lives had been lost in what was later shown to have been an avoidable tragedy. On the music front, 1966 threw up several gems, not least some groundbreaking offerings from The Beach Boys. It was, of course, the year that the magical singles Good Vibrations and God Only Knows and the grandiose album Pet Sounds set new standards in rock recording. Indeed, such was the excellence of the band at that time that it spurred The Beatles on to experiment and push their own musical boundaries still further. Motown was in its glory too, and The Four Tops epitomized all that was great about the sounds made under the guidance of Berry Gordy in the bustling, vibrant city that was Detroit. Reach Out I’ll Be There. Other memorable songs, were Dusty Springfield’s You Don’t Have To Say You Love Me, the Spencer Davis Group’s Somebody Help Me, the Rolling Stones Paint It Black, The Walker Brothers’ operatic The Sun Ain’t `Gonna Shine Anymore, and Chris Farlowe’s cover version of the Stones’ Out Of Time. All of them are classics of rock. Tom Jones’ Green, Green Grass of Home was the biggest selling single. Way before The Voice! George Harrison married Patti Boyd. Sergio Leone created the spaghetti western with The Good, The Bad and The Ugly starring Clint Eastwood. Due to the striking height difference between Clint Eastwood and Eli Wallach of over 9 inches, it was sometimes difficult to include them in the same frame. In the 1960s Michael Caine was a cocky young British movie star with a Cockney accent. He played a caddish womanizer in Alfie (1966) "Not a lot of people know that"
Adam Sandler, Halle Berry, David Schwimmer, David Cameron, Cindy Crawford, Helena Bonham Carter were all born in 1966. The first episode of Star Trek aired. The Beatles achieved their 10th number 1! The Sound of Music won Best Picture at the Oscars. Twiggy was named the face of ’66 by Daily Express. For a few years in the 1960s, London was the world capital of cool. When Time magazine dedicated its 15 April 1966 issue to London: the Swinging City, it cemented the association between London and all things hip and fashionable that had been growing in the popular imagination throughout the decade. London’s remarkable metamorphosis from a gloomy, grimy post-War capital into a bright, shining epicentre of style was largely down to two factors: youth and money. The baby boom of the 1950s meant that the urban population was younger than it had been since Roman times. By the mid-60s, 40% of the population at large was under 25. With the abolition of National Service for men in 1960, these young people had more freedom and fewer responsibilities than their parents’ generation. They rebelled against the limitations and restrictions of post-War society. In short, they wanted to shake things up… Added to this, Londoners had more disposable income than ever before – and were looking for ways to spend it. Nationally, weekly earnings in the ‘60s outstripped the cost of living by a staggering 183%: in London, where earnings were generally higher than the national average, the figure was probably even greater. This heady combination of affluence and youth led to a flourishing of music, fashion, design and anything else that would banish the post-War gloom. Fashion boutiques sprang up willy-nilly. Men flocked to Carnaby St, near Soho, for the latest ‘Mod’ fashions. While women were lured to the King’s Rd, where Mary Quant’s radical mini skirts flew off the rails of her iconic store, Bazaar. Even the most shocking or downright barmy fashions were popularised by models who, for the first time, became superstars. Jean Shrimpton was considered the symbol of Swinging London, while Twiggy was named The Face of 1966. Mary Quant herself was the undisputed queen of the group known as The Chelsea Set, a hard-partying, socially eclectic mix of largely idle ‘toffs’ and talented working-class movers and shakers. Music was also a huge part of London’s swing. While Liverpool had the Beatles, the London sound was a mix of bands who went on to worldwide success, including The Who, The Kinks, The Small Faces and The Rolling Stones. Their music was the mainstay of pirate radio stations like Radio Caroline and Radio Swinging England. Creative types of all kinds gravitated to the capital, from artists and writers to magazine publishers, photographers, advertisers, film-makers and product designers. Swinging London seemed a very dim and distant memory. Bob Dylan – Blonde on Blonde. The Beach Boys – Pet Sounds. The Rolling Stones – Aftermath. The Yardbirds – Roger the Engineer. The Mamas & The Papas – If You Can Believe Your Eyes and Ears. The Who – A Quick One. The Temptations – Gettin’ Ready. Jefferson Airplane – Jefferson Airplane Takes Off. The Rolling Stones British Tour 1966 The British Tour was a concert tour by the band. The tour commenced on September 23 and concluded on October 9, 1966. 14 January – Young singer David Jones changes his last name to Bowie to avoid confusion with Davy Jones (later of the Monkees). 19 January – Michael Tippett conducts the performance of his cantata The Vision of St Augustine in London. 6 February – The Animals appear a fifth time on The Ed Sullivan Show to perform their iconic Vietnam-anthem hit "We Gotta Get Out of this Place". 4 March – The Beatles’ John Lennon is quoted in The Evening Standard as saying that the band was now more popular than Jesus. In August, following publication of this remark in Datebook, there are Beatles protests and record burnings in the Southern US’s Bible Belt. 5 March – The UK’s Kenneth McKellar, singing "A Man Without Love", finishes 9th in the 11th Eurovision Song Contest, which is won by Udo Jürgens of Austria. 6 March – In the UK, 5,000 fans of the Beatles sign a petition urging British Prime minister Harold Wilson to reopen Liverpool’s Cavern Club. 16 April – Disc Weekly is incormporated with Music Echo magazine. 1 May – The Beatles, The Rolling Stones and the Who perform at the New Musical Express’ poll winners’ show in London. The show is televised, but The Beatles’ and The Stones’ segments are omitted because of union conflicts. 13 May – The Rolling Stones release "Paint It, Black", which becomes the first number one hit single in the US and UK to feature a sitar (in this case played by Brian Jones). 17 May – American singer Bob Dylan and the Hawks (later The Band) perform at the Free Trade Hall, Manchester. Dylan is booed by the audience because of his decision to tour with an electric band, the boos culminating in the famous "Judas" shout. 2 July – The Beatles become the first musical group to perform at the Nippon Budokan Hall in Tokyo. The performance ignites protests from local citizens who felt that it was inappropriate for a rock and roll band to play at Budokan, a place – until then – designated to the practice of martial arts. 11 August – John Lennon holds a press conference in Chicago, Illinois to apologize for his remarks the previous March. "I suppose if I had said television was more popular than Jesus, I would have gotten away with it. I’m sorry I opened my mouth. I’m not anti-God, anti-Christ, or anti-religion. I was not knocking it. I was not saying we are greater or better." 29 August – The Beatles perform their last official concert at Candlestick Park in San Francisco, California. 16 September – Eric Burdon records a solo album after leaving The Animals and appears on "Ready, Steady, Go", singing "Help Me Girl", a UK #14 solo hit. Also on the show are Otis Redding and Chris Farlowe. 9 November – John Lennon meets Yoko Ono when he attends a preview of her art exhibition at the Indica Gallery in London. 9 December – The Who release their second album A Quick One with a nine-minute "mini-opera" A Quick One While He’s Away. 16 December – The Jimi Hendrix Experience release their first single in the UK, "Hey Joe". 3 January – Camberwick Green is the first BBC television programme to be shot in colour. 3 March – The BBC announces plans to begin broadcasting television programmes in colour from next year. 5 April – The Money Programme debuts on BBC2. It continued to air until 2010. 23 May – Julie Goodyear makes her Coronation Street debut as Bet Lynch. She did not become a regular character until 1970. 6 June – BBC1 sitcom Till Death Us Do Part begins its first series run. 30 July – England beat West Germany 4-2 to win the 1966 World Cup at Wembley. Summer – Patrick McGoohan quits the popular spy series Danger Man after filming only two episodes of the fourth season, in order to produce and star in The Prisoner, which begins filming in September. 2 October – The four-part serial Talking to a Stranger, acclaimed as one of the finest British television dramas of the 1960s, begins transmission in the Theatre 625 strand on BBC2. 29 October – Actor William Hartnell makes his last regular appearance as the First Doctor in the concluding moments of Episode 4 of the Doctor Who serial The Tenth Planet. Actor Patrick Troughton briefly appears as the Second Doctor at the conclusion of the serial. 5 November – Actor Patrick Troughton appears in his first full Doctor Who serial The Power of the Daleks as the Second Doctor. 16 November – Cathy Come Home, possibly the best-known play ever to be broadcast on British television, is presented in BBC1’s The Wednesday Play anthology strand. 3 January – British Rail begins full electric passenger train services over the West Coast Main Line from Euston to Manchester and Liverpool with 100 mph (160 km/h) operation from London to Rugby. Services officially inaugurated 18 April. Stop-motion children’s television series Camberwick Green first shown on BBC1. 4 January – More than 4,000 people attend a memorial service at Westminster Abbey for the broadcaster Richard Dimbleby, who died last month aged 52. 12 January – Three British MPs visiting Rhodesia (Christopher Rowland, Jeremy Bray and David Ennals) are assaulted by supporters of Rhodesian Prime Minister Ian Smith. 20 January – The Queen commutes the death sentence on a black prisoner in Rhodesia, two months after its abolition in Britain. Radio Caroline South pirate radio ship MV Mi Amigo runs aground on the beach at Frinton. 21 January – The Smith regime in Rhodesia rejects the Royal Prerogative commuting death sentences on two Africans. 31 January – United Kingdom ceases all trade with Rhodesia. 9 February – A prototype Fast Reactor nuclear reactor opens at Dounreay on the north coast of Scotland. 17 February – Britain protests to South Africa over its supplying of petrol to Rhodesia. 19 February – Naval minister Christopher Mayhew resigns. 28 February – Harold Wilson calls a general election for 31 March, in hope of increasing his single-seat majority. 1 March – Chancellor of the Exchequer James Callaghan announces the decision to embrace decimalisation of the pound (which will be effected on 15 February 1971). 4 March – In an interview published in The Evening Standard, John Lennon of The Beatles comments, "We’re more popular than Jesus now". Britain recognized the new regime in Ghana. 5 March – BOAC Flight 911 crashes in severe clear-air turbulence over Mount Fuji soon after taking off from Tokyo International Airport in Japan, killing all 124 on board. 9 March – Ronnie, one of the Kray twins, shoots George Cornell (an associate of rivals The Richardson Gang) dead at The Blind Beggar pub in Whitechapel, east London, a crime for which he is finally convicted in 1969. 11 March – Chi-Chi, the London Zoo’s giant panda, is flown to Moscow for a union with An-An of the Moscow Zoo. 20 March – Theft of football’s FIFA World Cup Trophy whilst on exhibition in London. 23 March – Pope Paul VI and Michael Ramsey, the Archbishop of Canterbury, meet in Rome. 27 March – Pickles, a mongrel dog, finds the FIFA World Cup Trophy wrapped in newspaper in a south London garden. 30 March – Opinion polls show that the Labour government is on course to win a comfortable majority in the general election tomorrow. 31 March – The Labour Party under Harold Wilson win the general election with a majority of 96 seats. At the 1964 election they had a majority of five but subsequent by-election defeats had led to that being reduced to just one seat before this election. The Birmingham Edgbaston seat is retained for the Conservatives by Jill Knight in succession to Edith Pitt, the first time two women MPs have followed each other in the same constituency. 6 April – Hoverlloyd inaugurate the first Cross-Channel hovercraft service, from Ramsgate harbour to Calais using passenger-carrying SR.N6 craft. 7 April – The United Kingdom asks the UN Security Council authority to use force to stop oil tankers that violate the oil embargo against Rhodesia. Authority is given on 10 April. 11 April – The Marquess of Bath, in conjunction with Jimmy Chipperfield, opens Longleat Safari Park, with "the lions of Longleat", at his Longleat House, the first such drive-through park outside Africa. 15 April – Time magazine uses the phrase "Swinging London". 19 April – Ian Brady and Myra Hindley go on trial at Chester Crown Court, charged with three so-called Moors Murders. Liverpool win the Football League First Division title for the second time in three seasons. 3 May – Swinging Radio England and Britain Radio commence broadcasting on AM with a combined potential 100,000 watts from the same ship anchored off the south coast of England in international waters. 6 May – The Moors Murderers Ian Brady and Myra Hindley are sentenced to life imprisonment for three child murders committed between November 1963 and October 1965. Brady is guilty of all three murders and receives three concurrent terms of life imprisonment, while Hindley is found guilty of two murder charges and an accessory charge which receives two concurrent life sentences alongside a seven-year fixed term. 12 May – African members of the UN Security Council say that the British army should blockade Rhodesia. 14 May – Everton defeat Sheffield Wednesday 3-2 in the FA Cup final at Wembley Stadium, overturning a 2-0 Sheffield Wednesday lead during the final 16 minutes of the game. 16 May – A strike is called by the National Union of Seamen, ending on 16 July. 18 May – Home Secretary Roy Jenkins announces that the number of police forces in England and Wales will be cut to 68. 26 May – Guyana achieves independence from the United Kingdom. 6 June – BBC1 television sitcom Till Death Us Do Part begins its first series run. 23 June – The Beatles go on top of the British singles charts for the 10th time with Paperback Writer. 29 June – Barclays Bank introduces the Barclaycard, the first British credit card. 3 July – 31 arrests made after a protest against the Vietnam War outside the US embassy turns violent. 12 July – Zambia threatens to leave the Commonwealth because of British peace overtures to Rhodesia. 14 July – Gwynfor Evans becomes member of Parliament for Carmarthen, the first ever Plaid Cymru MP, after his victory at a by-election. 15 July – A ban on black workers at Euston railway station is overturned. 16 July – Prime Minister Harold Wilson flies to Moscow to try to start peace negotiations over the Vietnam War. The Soviet Government rejects his ideas. 20 July – Start of 6-month wage and price freeze. 26 July – Lord Gardiner issues the Practice Statement in the House of Lords stating that the House is not bound to follow its own previous precedent. 30 July – England beats West Germany 4-2 to win the 1966 World Cup at Wembley. Geoff Hurst scores a hat-trick and Martin Peters scores the other English goal in a game which attracts an all-time record UK television audience of more than 32,000,000. 1 August – Everton sign Blackpool’s World Cup winning midfield player Alan Ball, Jr. for a national record fee of £110,000. 2 August – Spanish government forbids overflights of British military aircraft. 4 August – The Kray Twins are questioned in connection with a murder in London. 5 August – The Beatles release the album Revolver. 10 August – George Brown succeeds Michael Stewart as Foreign Secretary. 12 August – Three policemen are shot dead in Shepherd’s Bush, West London, while sitting in their patrol car in Braybrook Street. 15 August – John Whitney is arrested and charged with the murder of three West London policemen. 17 August – John Duddy is arrested in Glasgow and charged with the murder of three West London policemen. 18 August – Tay Road Bridge opens. 24 August – Tom Stoppard’s Rosencrantz and Guildenstern Are Dead is first staged, at the Edinburgh Festival Fringe. 29 August – The Beatles play their very last concert at Candlestick Park in San Francisco, California. 3 September – Barely five months after the death of Barry Butler, a second Football League player this year dies in a car crash; 30-year-old John Nicholson, a Doncaster Rovers centre-half who previously played for Port Vale and Liverpool. 5 September – Selective Employment Tax imposed. 15 September – Britain’s first Polaris submarine, HMS Resolution, launched at Barrow-in-Furness. 17 September – Oberon-class submarine HMCS Okanagan launched at Chatham Dockyard, the last warship to be built there. 19 September – Scotland Yard arrests Ronald "Buster" Edwards, suspected of being involved in the Great Train Robbery (1963). 27 September – BMC makes 7,000 workers redundant. 30 September – The Bechuanaland Protectorate in Africa achieves independence from the U.K. as Botswana. 4 October – Basutoland becomes independent and takes the name Lesotho. 18 October – The Ford Cortina MK2 is launched. 20 October – In economic news, 437,229 people are reported to be unemployed in Britain – a rise of some 100,000 on last month’s figures. 21 October – Aberfan disaster in South Wales, 144 (including 116 children) killed by collapsing coal spoil tip. 22 October – British spy George Blake escapes from Wormwood Scrubs prison; he is next seen in Moscow. Spain demands that United Kingdom stop military flights to Gibraltar – Britain says "no" the next day. 25 October – Spain closes its Gibraltar border against vehicular traffic. 5 November – Thirty-eight African states demand that the United Kingdom use force against Rhodesian government. 9 November – The Rootes Group launches the Hillman Hunter, a four-door family saloon to compete with the Austin 1800, Ford Cortina and Vauxhall Victor. 15 November – Harry Roberts is arrested near London and charged with the murder of three policemen in August. 16 November – The BBC television drama Cathy Come Home, filmed in a docudrama style, is broadcast on BBC1. Viewed by a quarter of the British population, it is considered influential on public attitudes to homelessness and the related social issues it deals with. 24 November – Unemployment sees another short rise, now standing at 531,585. 30 November – Barbados achieves independence. 1 December – Prime Minister Harold Wilson and Rhodesian Prime minister Ian Smith negotiate on HMS Tiger in the Mediterranean. 12 December – Harry Roberts, John Whitney and John Duddy are sentenced to life imprisonment (each with a recommended minimum of thirty years) for the murder of three West London policemen in August. 20 December – Harold Wilson withdraws all his previous offers to Rhodesian government and announces that he agrees to independence only after the founding of black majority government. 22 December – Rhodesian Prime minister Ian Smith declares that he considers that Rhodesia is already a republic. 31 December – Thieves steal millions of pounds worth of paintings from Dulwich Art Gallery in London. Centre Point, a 32-floor office building at St Giles Circus in London, designed by Richard Seifert for property speculator Harry Hyams, is completed. It remains empty for around a decade. London School of Contemporary Dance founded. Mathematician Michael Atiyah wins a Fields Medal. The motorway network continues to grow as the existing M1, M4 (including the Severn Bridge on the border of England and Wales) and M6 motorways are expanded and new motorways emerge in the shape of the M32 linking the M4 with Bristol, and the M74 near Hamilton in Scotland. Japanese manufacturer Nissan begins importing its range of Datsun branded cars to the United Kingdom. The 1966 British Grand Prix was a Formula One motor race held at Brands Hatch on 16 July 1966. It was the fourth round of the 1966 World Championship. It was the 21st British Grand Prix and the second to be held at Brands Hatch. It was held over 80 laps of the four kilometre circuit for a race distance of 341 kilometres. was won for the third time by Australian driver Jack Brabham in his Brabham BT19, his second win in succession after winning the French Grand Prix two weeks earlier. New Zealand driver Denny Hulme finished second in his Brabham BT20, a first 1–2 win for the Brabham team. The pair finished a lap ahead of third placed British driver Graham Hill in his BRM P261. Brabham’s win ended a streak of 4 consecutive wins by Jim Clark at the British Grand Prix. Brabham’s win put him ten points clear in the championship chase over Austrian Cooper racer Jochen Rindt with Hulme and Ferrari’s Lorenzo Bandini a point further back. 7 October 1965: An experiment to broadcast a live game to another ground takes place. Cardiff City play Coventry City and the match is broadcast to a crowd of 10,000 at Coventry’s ground Highfield Road. 20 March 1966: The World Cup is stolen from an exhibition at Central Hall, Westminster, where it was on show in the run-up to this summer’s World Cup in England. 27 March 1966: The World Cup is recovered by Pickles, a mongrel dog, in South London. 16 April 1966: Liverpool seal the First Division title for the seventh time in their history with a 2–0 home win over Stoke City. 14 May 1966: Everton win the FA Cup with a 3–2 win over Sheffield Wednesday in the final at Wembley Stadium, despite going 2–0 down in the 57th minute. 11 July 1966: England, as the host nation, begin their World Cup campaign with a goalless draw against Uruguay at Wembley Stadium. 20 July 1966: England qualify for the next stage of the World Cup with a 2–0 win over France in their final group game. Roger Hunt scores both of England’s goals. 23 July 1966: England beat Argentina 1–0 in the World Cup quarter-final thanks to a goal by Geoff Hurst. 26 July 1966: England reach the World Cup final by beating Portugal 2–1 in the semi-final. Bobby Charlton scores both of England’s goals. 30 July 1966: England win the World Cup with a 4–2 win over West Germany in extra time. Geoff Hurst scores a hat-trick, with Martin Peters scoring the other goal. Cesar Harada , founder of MakerBay, with "Protei", a revolutionary shape-shifting sailing robot used to explore and protect the ocean with Open Source Technologies. It took inventors Cesar Harada and Shawn Frayne just a couple of days to create their latest product – an inexpensive children’s building toy consisting of colourful plastic rods with magnetised ends. Both men’s core expertise lies elsewhere: Harada designs flexible robotic boats that can be used on environmental missions; Frayne launched a micro-wind device company and went on to run Looking Glass, a start-up making 3D displays. Their collaboration came about because both are part of MakerBay, the shared production space Harada set up a little more than a year ago in Yau Tong, where hobbyists and inventors alike can gather to tinker, build, invent – and learn from each other. “The idea is a space like this where collaboration happens organically and we can invent something quickly. [Creating something] doesn’t have to be a very long journey. If you’re in the right place, with the right people and a lot of tools, and you build a network that supports these people, then the journey can be much faster,” Harada says. The maker movement, which former Wired magazine editor Chris Anderson described as “the web generation creating physical things rather than just pixels on screens”, is a nascent one in Hong Kong. Dim Sum Labs in Sheung Wan, the first hacker space in the city, has been joined only by MakerHive, a small co-working space in Kennedy Town, and Harada’s MakerBay, which occupies a 6,500 sq ft space in an industrial building and provides tools from screwdrivers and soldering irons to laser cutters and 3D printers. But they bring together diverse talents. MakerBay has attracted hobbyists such as Andrew Pearce, a frequent traveller using his stay in Hong Kong to create his dream surfboard, as well as companies such as Frayne’s Looking Glass. Originally based in Kwun Tong, the company moved to MakerBay shortly after it opened. Alvin Lee Shiu-pong, an engineer at Looking Glass, says he and his colleagues find the co-working platform a great place for developing new products. Lee says the “volumetric” displays they specialise in would be useful for the medical world and beyond. “Instead of dissecting bodies or looking at 2D images from books, students can use a volumetric display to learn about human bodies,” he says, gesturing towards a transparent brick inked with a detailed 3D display of the structures inside a skull. “All we need is to process the 3D information we’ve obtained [to form the display] and assign colours according to the different densities identified – a higher density would indicate bone and lower ones can be blood, flesh or tendon,” he explains. The same process could be applied to learn about the structures of insects or even micro-organisms, adds Lee, whose team is refining the next big thing from Looking Glass – a cube which can display LED sequences based on code that a user has written. British ecologistPearce shares his enthusiasm for the hacker space. Tired of paying hefty airline charges to ship his surfboards and of buying boards that don’t meet his preferences, he decided to make his own. He has been making good use of the tools at MakerBay and picking up skills at its workshops to experiment with different materials and methods of making surfboards. “It’s just a nice way of learning things,” says Pearce. “It’s the first time I tried to make something. Here, I’ve figured out how to make designs in 3D and make them with the laser cutter. I’ve done an induction workshop on woodworking, too. And if I managed somehow to get this new technique of building down then I guess it can be a saleable idea. Pearce might have picked up a few ideas at the Maker Faire Hong Kong in November, when veteran model maker Chung King-yang showed a foldable canoe made from plastic foam and epoxy resin. The two-day event, which drew entries from more than 300 individual makers and schools, was organised by Dr Choy Sze-tsan. An assistant professor in the school of design at Polytechnic University, Choy previously sponsored a mini event run by the Hong Kong Makers’ Club. But after three years, he decided it was time to turn the faire into a bigger event and involve more schools. Harada presented his building toy at the event and the positive feedback has encouraged him to put it on the market soon. As might be expected, Dim Sum Labs was also present and ran soldering workshops. Visitors got the chance to test-drive underwater robots made by German Swiss International School, get their hands on different maker items and, more importantly, be inspired. While conventional fairs tend to be places to sell things, Maker Faires are all about nurturing creativity and sharing of knowledge, Choy says. At its heart, design covers the broader intention to identify problems and come up with solutions to improve our world, which has a lot to do with the maker culture, he adds; it’s not simply about enhancing aesthetics. So although some people may consider items featured at the show to be useless stuff, the ideas may be the genesis of something far bigger. “A successful invention comes not overnight, but after tonnes of experimentations. At the Maker Faire, people can see so many different possibilities of solving problems creatively, it’s impossible for them not to get inspired,” Choy says. Harada agrees: “Everyone in their heart has the desire to do something exciting with their life and if you only work on a computer, there’re some limitations. But once you start to make something, you can build an object or change the environment. Some enthusiasts view the maker movement as holding the seeds to a third industrial revolution. Jason Hsu Yu-jen, founder of Taiwan’s MakerBar, goes so far as to say that our future may lie in the maker culture.Navigating a power drill kart made by Wheel Thing Makers. Navigating a power drill kart made by Wheel Thing Makers. 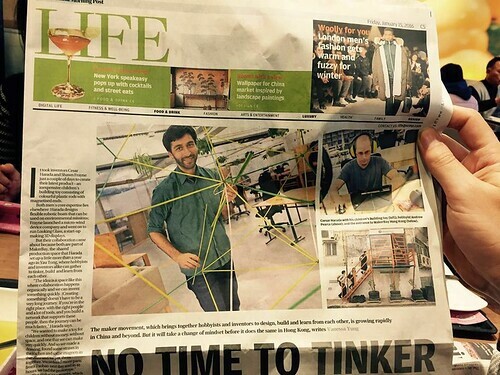 “MakerBar is more than just a co-working space. It has evolved to become a global platform,” says Hsu, who was in Hong Kong last month to speak at a symposium organised by the Hong Kong Federation of Design Associations. “Most people think about makers as a business model. That’s wrong. The maker culture is not just about [using] 3D printing or laser cutters. [Being a] maker is a mindset. It’s a way to solve problems creatively. “What you see as the maker movement today is what internet or software was back in the early ’80s when Steve Jobs first launched the Macintosh personal computers. In the future, because of de-monetisation and democratisation of technology, the cost for technology would be almost free and you need to use your service to make money, not with the machine. However, compared to the mushrooming maker spaces in Taiwan and Shenzhen, the movement in Hong Kong clearly has a long way to go. This lag is because “Hong Kong traditionally is more service- and finance-oriented. People here are less about making things. They’re more about transactions,” Hsu says. MakerBay’s Harada says another reason why the maker culture has been so slow to develop in the city is because “the mentality of Hong Kong has been educated too much towards competition and not towards collaboration”. “They have been trying more to take advantage of each other instead of helping each other. This has to change,” he says. This entry was posted in Uncategorized on 13/01/2018 by klarmprototyping. The once beautiful Eudunda Railway Station in South Australia. The line opened to here in 1878. It is now terribly vandalised. What a pity and a shame on the government. Love the gables and air vents. The Government extended the Kapunda railway to Eudunda in 1878. This provided a great boost to the newly settled town which had been surveyed in 1872. Eudunda was selected as a town site on the eastern side of the Mt Loft Ranges at 415 metres above sea level, with annual rainfall of 450 mm. To the east of Eudunda the rainfall drops sharply and at 250mm Goyder’s Line is crossed, which depicts the limit of reliable cereal cropping land. Eudunda is often one of the coldest places in SA during the winter months. The town was established in 1872 a few years prior to the arrival of the railway and it was located near a permanent spring. A town water supply was always essential in the 19th century. Thus the name Eudunda is of aboriginal derivation, Ngadjuri meaning “sheltered water or spring.” This water supply was crucial for the sheep and cattle overlanders coming down from Morgan. In 1872 A & G Neumann erected a flour mill, and in 1874 Mr Appelt opened his general store, having also been appointed Postmaster. The earliest settlers were second generation Lutheran Germans moving on from the Barossa Valley. With the opening of the railway to the Adelaide in 1878 the district thrived. To complement their flour mill Laucke’s established a chaff mill in Kapunda Street and the Eudunda Bakery has been in operation for over 100 years. Eudunda foundries provided employment for many town dwellers, especially the Lutz Farm Machinery Foundry which operated 1892-1905 until it was taken over as Jansen’s Foundry (operated 1905-1951). This foundry survived until recently and was last being run by a Canadian company trading as Emco-Wheaton in the 1980s. It still employed 30 men in the 1980s. A new engineering firm established in Eudunda in 1985 called Buschutz Engineering. The company now employs 20 staff producing hay conditioners, water tanks, silos, fertilizer spreaders and under vine feeders. Edwin Davey the successful flour miller from Angaston later had a second flour mill built in Eudunda to complement his mills in Salisbury, Port Adelaide, Melbourne and Sydney. This second flour mill later became Laucke’s mill. It opened in 1879 and still stands in Kapunda Road. But before the industry got under way the hotels opened! The first was the Eudunda Hotel which opened in 1873 (what we see today is the 1886 building) and the Royal Hotel which was built as a grand two storey structure in 1878. The first banking service operated from Appelt’s Store in 1877 with the first National Bank (a house type building) being erected in 1888. When it opened, all advertisements for its services were in German. Another indication of the strong German origins of the town was the establishment of the Eudunda Club in 1888 as a club for German workingmen, especially employees of the local foundry. The Club, like German schools etc was closed by Act of parliament in 1917 but it re-opened in 1919. It is still operating in Bruce Street. The Club built the Centenary Hall in 1900 which became the town Institute building when the Town Council took it over. 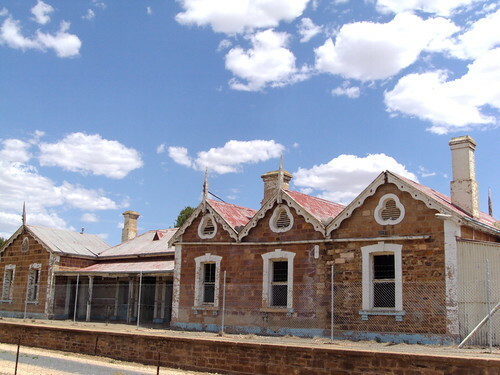 Police were stationed in Eudunda from 1877 but the first police station was not built until 1883. The town had an early fire station, and like most SA towns the hospital was not opened until the 1920s. It opened in 1922. The first government school opened for classes in 1878 in a large brick and stone Gothic style building. During World War One it became a Higher Primary School offering classes for year 8 and year 9 students. A new building was provided for the town in 1946 and opened as Eudunda Area School (which had been established in 1943) as around half a dozen outlying schools had been closed during the Second World War. From that time children were bussed into Eudunda Area School. At some stage the old 1878 school buildings were demolished. The Lutheran churches provided some early school classes but Emmaus Lutheran Church did not open a formal school until 1904 in Eudunda. The school was closed by state legislation in 1917 during World War One, but it re-opened in 1925 and still operates today with over 200 enrolments. Lutheran church services were mainly conducted in German until the 1920s. The last German language church services in the district were held at Point Pass Lutheran Church in 1939. The outbreak of World War Two finally stopped the German language services. The history of the churches in Eudunda show the strong Lutheran heritage. Emmaus congregation formed a Lutheran Church in 1871 as the town began. They built a fine church in 1884 at a cost of £1,100. Another Lutheran congregation formed in 1885 and built a second Lutheran Church, St Paul’s in 1893. St Paul’s finally closed in 1979 and a new church for the combined congregations was erected in 1980 called St John’s. The Anglican Church was set up in 1889 when they purchased a former Lutheran Church. It is called St Hilda’s. The Methodist Church was opened in 1885. There is also a Catholic Church in Eudunda. Commercially the big success of Eudunda was the establishment of Eudunda Farmers’ Cooperative in 1896. It was founded by Thomas Roberts who died at his North Adelaide home in 1922. Roberts used to purchase cut Mallee wood from farmers during the great droughts and depression of the 1890s, especially from the Murray Flats to the east of Eudunda. He formed a cooperative so that farmers could buy their groceries and grain seeds etc in bulk at reduced prices. The society was formed in 1896 with 100 member families based on the railway wood yards at Sutherlands, Bower and Mount Mary etc. Among the many successful businesses in Eudunda was Wiesner and Company timber and hardware merchants. Their impressive warehouse and store still remains in the town. The Wiesner family started a blacksmith and foundry business in Eudunda in 1884 which eventually employed 50 people. In 1905 they sold that business and opened the iron mongers and furniture store in large two storey premises to which they added. It became the largest hardware and furniture store outside of Adelaide. It sold everything from pianos, china, glassware and silver cutlery to iron, nails tools and timber and sewing machines. Johannes Wiesner and his son Adolph ran the business until it was sold in 1951 but they had downsized it in 1945 when they sold they sold part of the warehouse to the Masonic Lodge. Interestingly Adolph married an English girl Mary Cranston and he became a Methodist and his grandson became a Methodist Minister. When the government extended the railway form Kapunda to Eudunda in 1878 they wanted to push it further across the Murray Flats to Morgan. Why, one might ask? Well, they wanted to tap into the lucrative river trade that came down from New South Wales. Wool was still shipped down the Darling and Murray, and supplies shipped up the river to many NSW properties. By having a railway to Morgan and extensive wharves there, the SA government could transport the wool to Port Adelaide for transhipping to Europe. The rise of Morgan, of course, was to mean the demise of the major shipping ports lower down the Murray such as Milang, Goolwa and Murray Bridge. Because this trade was so important economically the train line crossed the flat through Mount Mary to Morgan in 1878. During the 1890s a quarter of ALL wool exported from SA came from other colonies, mainly NSW but some also came from Queensland and Victoria. Once the South Australian Railways were making a profit (their first profits were in 1907) they also extended the railway from Eudunda to Robertstown in 1914. Passenger services to Robertstown ceased in 1962. This entry was posted in Uncategorized on 12/01/2018 by klarmprototyping.